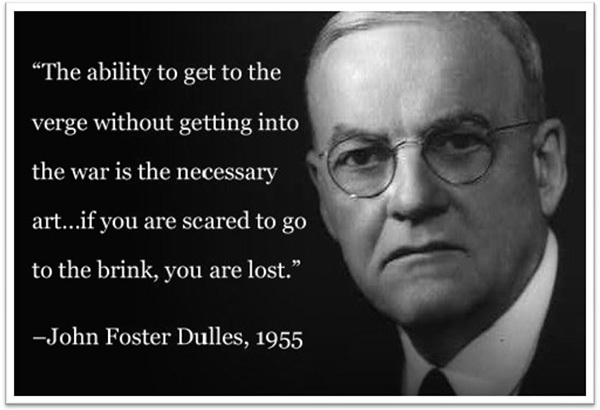 At that same time, Adlai Stevenson, who was twice the democratic candidate for president, created the term “brinkmanship,” a term that was defined by John Foster Dulles as quoted in the above image. Brinkmanship is essentially “chicken,” except that it’s played by men in suits and is potentially far more disastrous. There’s a general assumption that people in suits and people “in charge” are somehow more rational and/or more intelligent than teenagers who enter into a motorized spitting contest, but this is not the case. The people in suits merely put a better spin on their idiocy and risk the lives of tens of millions in doing so. Brinkmanship became the byword for US policy toward Russia and, by extension, Cuba. Master trader Jeff Clark made 10 times his money on the Friday afternoon right before Black Monday in 1987… which at the time was the worst stock market crash in 25 years. On March 2nd 1999 – just before the dot-com crash – Jeff says he made an investment that netted him more in a single day than he’d ever made before in his life. And from 2007-2009 – while many folks thought the world was coming to an end – Jeff identified 84 opportunities to make money, including 12 triple-digit windfalls… with gains like 133%, 182%, 166%, 225%, and more. Now, for the first time in our firm’s history, Jeff is going to reveal the perfect play for today’s market – and show you how he’s used it to target trades that have seen returns of 1,174% MORE MONEY than his regular recommended trades… every single year since 2004… Details here. In an international shoving match that lasted into the 1960s, the US would give Russia a Dulles-inspired shove. The Russians would shove back and so on, each aware that he could not be the first to back down, or, as Mister Dulles said, he would be lost. This reached its peak in the Cuban missile crisis of 1962. The USSR shipped missiles with nuclear warheads to Cuba and the US discovered it. President Kennedy blockaded Cuba and, for twelve days, the world lived on the very brink of nuclear war. Mister Kennedy, of course, brought in the Joint Chiefs of Staff of the Military—the most respected and experienced generals in the US armed forces. Their joint recommendation was for Mister Kennedy to “push the button—now!” They stated that the Russians unquestionably had their finger placed just above their own button and the “winner” would be the one who pressed first. But, amazingly, the two leaders had cool enough heads to work out an agreement in which each would back off substantially from the situation. Clearly, the military leaders of both empires disagreed with the decision. They were eager to play “chicken” and worry about the results at a later date (if there were one). Surely, Mister Dulles would have agreed with them, had he been consulted. Another individual who is on record as having agreed with them was Fidel Castro. Although his country would have unquestionably been devastated first in such a conflict, he was furious that he hadn’t been a party to the discussion between the leaders of the two empires. He was far less concerned with the future of the Cuban people (and humanity in general) than he was about being recognized as an important player in the discussion. Trouble is, in warfare, the generals on both sides (as evidenced in the Cuban missile crisis) are equally determined to be the winner—a condition which virtually guarantees untold death and destruction. History is full of examples of national leaders who continued to wage war until the death of the last man—then threw women and children in to continue the fight, long after all hope for winning was gone. There are very few Kennedys and Khrushchevs in history. However, there are countless Napoleons, Pattons, MacArthurs, etc. All were great tacticians; however, all were also guilty of allowing their egos to override their common sense, and each was prone to being recklessly aggressive, sometimes leading to defeat. It should also be mentioned that, in 1962, the US Secretary of Defense was not a military man, but a business executive. As a businessman, Robert McNamara believed that negotiation was always preferable to blind aggression, and he was instrumental in supporting Mister Kennedy’s desire to work with the Russians toward a solution. Again, this is an historic rarity. In the present US, that post is held by one General “Mad Dog” Mattis and the National Security Advisor is one John Bolton—as hawkish and obsessive a man as has ever held this post. And so, once again, the US government has chosen brinkmanship as its national policy and, once again, it’s provoking Russia. In the Cuban missile crisis, China was quick to throw its military weight behind Russia, and we can expect this once again. The primary difference between 1962 and today is that the world at large sees the US very much as the aggressor—not as a defender of democracy, as the US promotes itself. And today, the US has far fewer cards to play. So, if the Cuban situation was an historic anomaly, what is the rule, historically? Well, the US most certainly didn’t invent brinkmanship. It’s common for one nation or empire to push another until the situation explodes. Prior to World War I, all of Europe was spoiling for war and a minor event—an assassination by one man—was enough to light the powder keg. In 1941, Japan only attacked Pearl Harbour after the US had cut off its supply of oil. The Spanish-American War was justified by the sinking of a ship in Havana Harbour—and to this day, it’s uncertain whether it was caused by an engine-room accident. Similarly, the American Revolution was kicked off by a standoff between colonists and British regulars, in which someone on one side or the other, perhaps out of nervousness, squeezed the trigger of his musket too tightly, causing chaos. The list of such spark points to war is endless. Virtually all wars in the last hundred years have been precipitated by brinkmanship, followed by a relatively minor “trigger” event. In each case, the war was promised to be brief and victorious by those who recommended full-scale retaliation, and invariably, they were manifestly incorrect.